In praise of: Roddy Frame… | Scots Whay Hae! Of all Scotland’s New Towns East Kilbride arguably managed to prove the one that provided the most cultural interest. Cumbernauld had the kudos of being the home of Gregory’s Girl, but that was greatness thrust upon it. East Kilbride, at least for a while, provided art and attitude that was all its own. 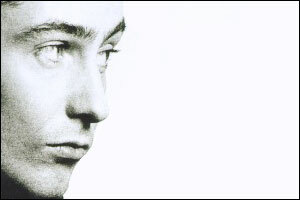 The Jesus and Mary Chain, who begat their drummer Bobby Gillespie to Primal Scream, Iain Harvie from Del Amitri and Davy Scott of the Pearlfishers are just some of the best that East Kilbride has to offer, but the top of the pops is Roddy Frame, with or without his Aztec Camera. If Orange Juice were Postcard Record’s Velvet Underground (see Orange Juice jonesing ) then Aztec Camera were their Byrds with Roddy playing Roger McGuinn’s chords and wearing his fringe jacket. Plenty of songwriters deal with the pain of being in and out of love, but no one captures the feeling that can accompany love like Roddy Frame. From the opening bars of debut single Just Like Gold through first chart botherer and radio favourite Oblivious, to Western Skies, the title track from his most recent solo offering, Frame expresses the unfettered joy of being in love better than anyone. Which other Scottish artist would release an album called Love and leave it untouched by weary cyniscism? I can only put forward Teenage Fanclub as a suggestion, and more on them coming soon. Many people say, usually with reference to sport, that winning is all. I couldn’t disagree more. For me it is the style in which the game is played that’s most important. If I could be any musician it would probably be Roddy Frame, someone who understands it’s not about winning, it’s about how you play the game. Few do it better.